Scirpus capitatus L. Sp. PI. 48. 1753. Eleocharis capital a R.Br. Prodr. Fl. Nov. Holl. 1: 225. 1810. 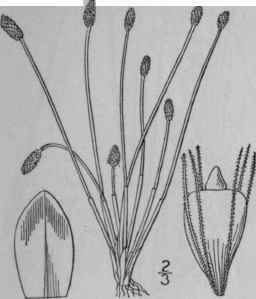 Eleocharis dispar E. J. Hill, Bot. Gaz. 7: 3. 1882. E. capitata dispar Fernald, Rhodora 8: 129. 1906. Annual, roots fibrous, culms densely tufted, nearly terete, almost filiform, rather stiff, 2'-10' tall. Upper sheath 1-toothed; spikelet ovoid, obtuse, much thicker than the culm, 1 1/2"-2 1/2" long, 1"-1 1/2" thick, many-flowered; scales broadly ovate, obtuse, firm, pale or dark brown with a greenish midvein, narrowly scari-ous-margined, persistent; stamens mostly 2; style 2-cleft; bristles 5-8, slender, downwardly hispid, as long as the achene; achene obovate, jet black, smooth, shining, nearly 1/2" long; tubercle depressed, apiculate, constricted at the base, very much shorter than the achene. In moist soil, Maryland to Florida, west to Indiana and Texas. Widely distributed in tropical regions. July-Sept.
Scirpus ovatus Roth, Catal. Bot. 1: 5. 1797. 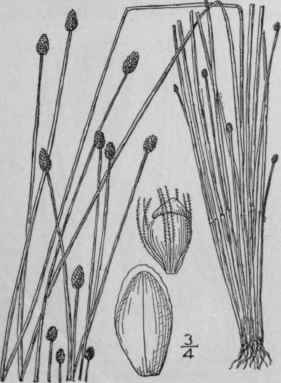 Eleocharis ovata R. & S. Syst. 2: 152. 1817. Eleocharis diandra Wright, Bull. Torr. Club 10: 101. 1883. Annual, roots fibrous, culms tufted, slender or filiform, rather deep green, nearly terete, mostly erect, 2'-16' tall. Upper sheath 1-toothed; spikelet ovoid or oblong, obtuse, many-flowered, 2"-5" long, 1"- 1 1/2" in diameter; scales thin, oblong-orbicular, very obtuse, brown with a green midvein and scarious margins; bristles 6-8, sometimes fewer or wanting, deciduous, usually longer than the achene; stamens 2 or 3; style 2-3-cleft; achene pale brown, shining, lenticular, obo-vate-oblong, smooth, 1/2" long or more; tubercle deltoid or depressed, acute, about one-forth as long as the achene and narrower. In wet soil, New Brunswick to Ontario, Michigan and Connecticut. Also in Europe. July-Sept.
Scirpus obtusus Willd. Enum. 76. 1809. 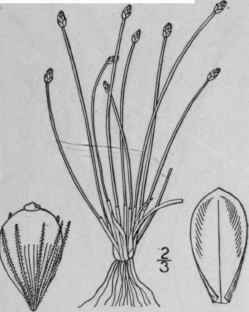 Eleocharis obtusa Schultes, Mant. 2: 89. 1824. E. obtusa jejuna Fernald, Proc. Am. Acad. 34: 492. 1899. Annual, with fibrous roots; culms tufted, slender to filiform, 1-18' long. Upper sheath 1-toothed; spikelet ovoid to ovoid-oblong, 1"-6 1/2" long, 1"-2 1/2" thick, densely many-flowered; scales broadly obovate, obtuse, brown with pale margins; achene pale brown, obovate, smooth, lenticular, about 1/2" long; tubercle deltoid or depressed, nearly or quite as wide as the top of the achene; bristles mostly longer than the achene. In wet soil. Cape Breton Island to Minnesota, British Columbia, Florida, Texas and Oregon. July-Sept.